Chinese Snuff Bottles No. 1, p. 19, top right. Puddingstone is the general term for a conglomerate of sedimentary flint pebbles in a matrix of chert - both part of the large quartz family. 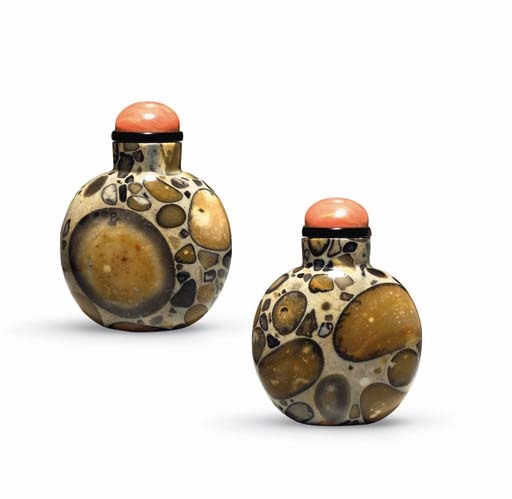 Bottles carved from this striking material come in a wide variety of colors, textures, sizes and shapes. The stone's appearance is not dissimilar to plum pudding, from which it derives its name. This bottle is of the popular compressed oval form typical of a series of bottles dating from the mid-Qing period. For a range of bottles in this material, see B. Stevens, The Collector's Book of Snuff Bottles, no. 609-17. The variation in size of the pebbles sets up an attractive counterpoint to the beige matrix and the combination of shapes and sizes creates a strong design that compliments the simple and tactile form.